PIBO’s fall season began auspiciously on August 1st, when two American White Pelicans were spotted on census, mixed in among the thousands of Double-Crested Cormorants at the tip of Fish Point. These large, distinctive birds breed in the Prairie Provinces and only rarely come as far east as Ontario. PIBO staff returned to Fish Point that afternoon and observed four pelicans together, which were seen again on the 3rd. 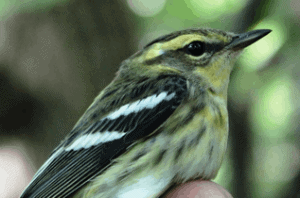 Overall, census and banding have been slow. Locally breeding birds have made up the bulk of our observations, and Fox Pond has been the scene of the most songbird activity due to the large numbers of fledged young and their parents who feed in the area. Indigo Buntings, Northern Cardinals and Yellow Warblers have been seen daily. Large groups of Baltimore Orioles have been moving through the netting area, feeding and preparing for their trip to their wintering grounds in Central and South America. The temperature, which has felt unseasonably cool of late, dropped markedly on the 15th to 5ºC with north-west winds, bringing in several new warbler species for the fall. A Prothonotary Warbler and a Northern Parula were seen on census, two American Redstarts and a Blackburnian Warbler were banded, and a Canada Warbler was observed in the netting area. This was our busiest day so far, with a total of six birds banded. Overall, conditions in the netting area have been good. The mud that plagued us over much of the spring has dried up now, and instead of wet feet and muddy pants the worst inconvenience we face is the large number of spiders who persist in building their webs right across the net lanes – always a fun experience first thing in the morning! PIBO would like to congratulate the Pelee Island Heritage Center and everyone who was involved in making the first Pelee Unplugged music festival such a great success! Thank you, too, to everyone who stopped by our table on Sunday!